Fanatic Muslims in the village of al-Naghameesh in Sohag, some 450km south of Cairo, attacked the Copts in the village todayele Friday 25 November, on rumour that they were opening a church. 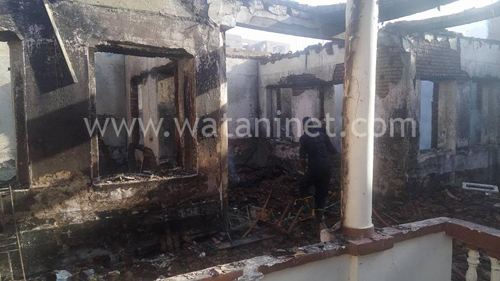 A guesthouse owned by Ihab Tamer, a Coptic doctor, was burned, the façades of 10 Coptic-owned houses were damaged, and a house and shop owned by Ishaq Hanna were plundered and looted. The attackers cut the road so that the fire trucks could not enter the village; they also cut off the water and power supply to the village. Naghameesh includes a 2000-strong Coptic population who had built a four-storey building to serve as a community centre that housed a children’s pre-school nursery and a home for the aged. They also used it for prayers, since the village includes no church; the nearest is in the town of al-Kosheh 8km away. With the passage of the new law for building churches last August, Naghameesh Copts applied for legalisation of the community centre church, but this has yet to gain approval. The village priest, Father Macarius, had asked Bishop of al-Kosheh, Anba Wissa, to preside over Mass held in memorial of the priest’s father on Tuesday 22 November, and Anba Wissa graciously accepted. Even though the Bishop met the village mayor and presented him with a copy of the Qur’an, the Muslim villagers thought he had come to open a church. They gathered after Friday prayers and waged their attack. The Copts called the police who arrived, surrounded the village, and dispersed the attackers. Governor of Sohag, Ayman Abdel-Moniem; and Mustafa Muqbel, Chief of Security of Sohag, also headed to the village where they inspected the situation. Governor Abdel-Moniem ordered that the ruined guesthouse should be repaired at the expense of the governorate, and promised that justice would be served. A source from parliament told ++Watani++ that some 20 suspects were caught and the incident is being investigated.